VideoSafe gives video surveillance a new dimension. VideoSafe sets new standards within distributed video surveillance with the most open and flexible concept for scalability and availability on the market. Based on PC-technology Safecon Video provides maximum performance, configurations based on individual requirements and optimum possibilities for later expansion. The intelligent camera stations handle the reception of video data from the cameras. Incoming video calls are handled automatically, and when motion is detected, a video alarm is generated. All image data pass an advanced image analysis where even the slightest motion will be detected. The motion detection can assist the operator in deciding what camera to watch. As a result the operator does not need to continuously supervise the cameras, but only needs to act on exceptions. The motion detection also makes it possible to display/record only images with motion detected. All image data are stored on a dedicated file server, and image data will automatically be deleted after a specified period, or when the total amount of data exceeds a certain amount of space for a certain camera. Safecon Video is compatible to any video hardware with an open interface, and adding additional video hardware is done without changing the video software. ¹ However changes to the video software will affect all cameras, regardless of the hardware. The Live View is a customer specific window for displaying live images. 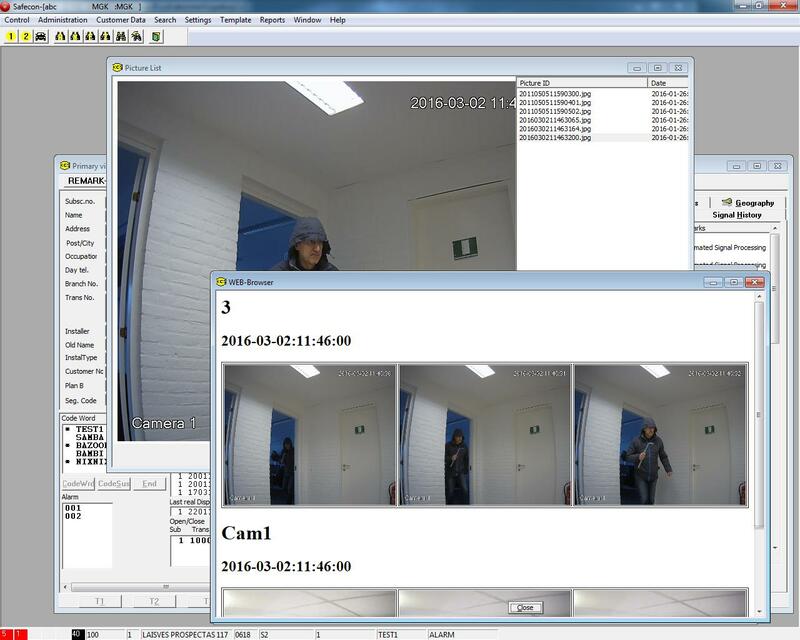 It is possible to display live images from 1 to 4 cameras, in a Single or Quad Screen. Live View connections can manually be established and image recording can be started. Only operators handling the signals are allowed to establish connection to the cameras and to start image recording. Remote PTZ-control and remote relay control is also controlled from the Live View. The Sequence Browser is a customer specific window from which all recorded image sequences can be viewed as well as printed to a locally installed printer. Using the VCR-control panel, playback can be carried out both manually and automatically. Click here to request more info about VideoSafe or to get a quotation.